Mikhail Tal, known as Mischa, (Riga, 9 November 1936 – Moscow, 28 June 1992) was a Soviet–Latvian chess player, a Grandmaster, and the eighth World Chess Champion. Tal played in 21 Soviet championships, winning it six times, a record only equalled by Botvinnik. He was a member of eight Soviet teams which won the gold medal in chess Olympiads. He won the individual gold medal five times. He holds the records for both the first and second longest unbeaten streaks in competitive chess history.p43 Many authorities consider him to have been the greatest attacking player of all time. Tal won the strong 1958 Interzonal tournament, and the Candidates' tournament in Yugoslavia, 1959. In the Candidates he finished first, with 20/28 points, ahead of Paul Keres with 18.5, followed by Tigran Petrosian, Vasily Smyslov, Bobby Fischer, Svetozar Gligorić, Friðrik Ólafsson, and Pal Benko. Tal he won all four individual games against Fischer, and took 3½ points out of 4 from each of Gligorić, Olafsson, and Benko. This shows his complete dominance over the less strong players. 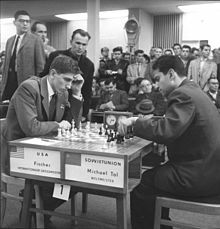 In 1960, at the age of 23, Tal defeated Mikhail Botvinnik in the Moscow World Championship match, by 12.5–8.5 (six wins, two losses, and thirteen draws). This made him the youngest-ever world champion, a record later broken by Garry Kasparov. Botvinnik, who had never faced Tal before, won the return match against Tal in 1961 by 13–8 (ten wins to five, with six draws). Between the matches Botvinnik thoroughly analyzed Tal's style, and turned most of the return match's games into close manoeuvres and endgames, rather than the complicated tactical melées which were Tal's preference. Tal's short reign atop the chess world made him one of the two so-called 'winter kings' who interrupted Botvinnik's long reign from 1948 to 1963 (the other was Smyslov, world champion 1957–1958). Tal played in a total of six Candidates' tournaments and match cycles, though he never again earned the right to play for the world title. In 1962 at Curaçao, he had serious health problems, having undergone a major operation shortly before the tournament, and had to withdraw three-quarters of the way through, scoring just seven points (+3 -10 =8) from 21 games. Poor health was part of his life. Tal was an alcoholic, and a chain smoker.p409 At 23 he had a diseased kidney, and his health became uncertain. He recovered much of his form when, after some years, the kidney was removed. Eleven years after he lost the world championship, he had a record sequence of results. From July 1972 to April 1973, Tal played 86 consecutive games without a loss (47 wins and 39 draws). Between 23 October 1973 and 16 October 1974, he played 95 consecutive games without a loss (46 wins and 49 draws), shattering his previous record. These are the two longest unbeaten streaks in modern chess history. Tal was a charming and brilliant man, who was always willing to talk about chess with players of all standards. His early death was much mourned, though it was not unexpected. The Mikhail Tal Memorial tournament is held in Moscow each year since 2006 to honour his memory. The extent of Tal's alcoholism was quite astonishing. Vlastimil Hort, the top Czech player of the 1960s and 70s, has given a vivid account. Hort played at the Moscow tournament of 1963, with many of the top Russians. When he was due to play Tal, his opponent showed up very late, and drunk. He almost fell asleep at the board. Tal staggered away from the board, and returned with shaking hands, and unable to light a cigarette. Hort later found out that Tal had been grabbed by other Russians, and doused with cold water! Tal still managed to draw the game. Tal, Mikhail 1997. The life and games of Mikhail Tal. Everyman Chess. ISBN 1-85744-202-4. Tal, Mikhail 2001. Tal-Botvinnik, 1960. Russell Enterprises. ISBN 1-888690-08-9. Tal, Mikhail, Iakov Damsky and Ken Neat (transl.) 1994. Attack with Mikhail Tal. Everyman Chess. ISBN 1-85744-043-9. Thomas, Hilary 1979. The complete games of Mikhail Tal. 3 vols, 1936–59, 1960–66, 1967–73. Batsford, London. Robert James Fischer vs Mikhail Tal, Belgrade, Candidates' Tournament 1959, Sicilian Defence, Fischer–Sozin Variation (B87), 0–1 In 1959, Bobby Fischer was too inexperienced to meet Tal with success. Still, their games from this time are full of interesting tactics. Mikhail Botvinnik vs Mikhail Tal, World Championship Match, Moscow 1960, 6th game, King's Indian Defence main line (E69), 0–1 An excellent sample of Tal's style from the first Botvinnik–Tal match. Tal sacrifices a knight for the attack and Botvinnik is not able to find a defence. Boris Spassky vs Mikhail Tal, Tallinn 1973, Nimzo-Indian Defence, Leningrad Variation (E30), 0–1 A game fuelled with tactics from its first moves. Black attacks in the centre and then starts a king chase. ↑ Tal's gravestone has June 27 as the date of his death. All other sources consulted give June 28, including My preat predecessors, part II, page 382, by Garry Kasparov and The life and games of Mikhail Tal, page 6, and DeadOrAliveInfo.com. ↑ 4.0 4.1 Soltis, Andrew 2002. Chess Lists 2nd ed, McFarland, Jefferson NC. ↑ Clarke P.H. 1960. Tal's best games of chess. Bell, London. ↑ "1959 Yugoslavia Candidates Tournament". ↑ McFadden R.D. (June 29, 1992). "Mikhail Tal, a chess grandmaster known for his daring, Dies at 55". New York Times.